In Trail 29 we turn south and head to the southern end of Cambridgeshire. This area is rich in fighter stations, both RAF and USAAF. Home to Duxford and Bader’s ‘Big Wing’, Mustangs, Spitfires and Hurricanes once, and on many occasions still do, grace the blue skies of this historical part of the country. Graveley sits to the south of Huntingdon, a few miles east of St. Neots. It takes its name from the village that lays close by to its eastern side. It would see a range of changes, upgrades and improvements and be home to many different residents during its wartime life. Built as a satellite for nearby RAF Tempsford, Graveley opened in March 1942 with 161 (Special Duty) Squadron. Their role was to drop SOE agents in occupied France, a role 161 would undertake throughout its operational life. Equipped with Lysander IIIA, Hudson MkI and Whitley Vs, they were somewhat dwarfed by the enormity of Graveley airfield. 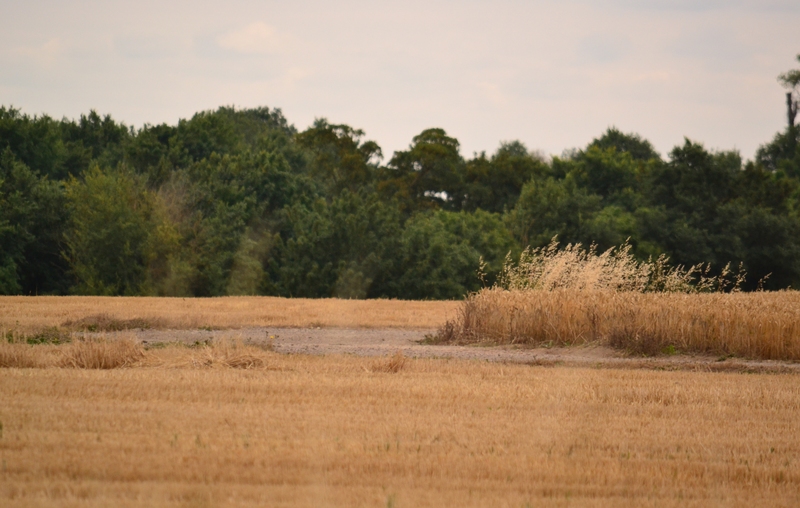 Within a month of arriving however, they would leave and move away to their new permanent base at RAF Tempsford, leaving the open expanse of Graveley behind. Built as a standard ‘A’ class airfield for 8 Group, Graveley would have three concrete runways, the main laying E-W, initially of 1,600 yds long; the second, NW-SE of 1,320 yds and the last laying NE-SW 1,307 yds. Later these would be lengthened to 2,000, 1,420 and 1,407 yards respectively as improvements and upgrades would take place. Accommodation was spread around the north side of the airfield, across the main Offord to Graveley road. These were spread over nine accommodation sites, incorporating a separate communal and sick quarters. Graveley could accommodate up to 2,600 personnel which included 299 WAAFs. As with all sites, the bomb store was well away from the accommodation to the south-west, partially enclosed by the three runways. The 50 foot perimeter track linked the runaways with 36 pan style hardstands (after the extension three of these were replaced by loops). The main technical site lay to the north-west, where two of the three T-2 hangars were located, the other being to the south-east next to a B-1. Graveley lay operationally dormant following the immediate departure of 161 Sqn in April 1942. However, in May’s ‘1000’ bomber raid, aircraft from 26 OTU flew from Graveley as part of the massive operation. Four Wellingtons (all Mk Ic) failed to return; WS704, DV740, DV707 and DV709 were lost during the night of May 30th/31st – a reality check for those at this quiet Cambridgeshire base. As Bomber Command developed the new Pathfinder Force (PFF) Graveley would find itself a major player. Its first residents, of the new 8 Group, were 35 Sqn (RAF) with Halifax IIs. These would be upgraded to MK IIIs in the following October and Lancaster I and IIIs a year later. Arriving on August 15th 1942, they would have their first mission from here just three days later. On the night of 18th/19th August, a total of 31 PFF aircraft left to mark the target at Flensburg. Poor weather and strong winds prevented accurate marking and two Danish towns were accidentally bombed as a result. A rather disastrous start for 35 Sqn. Another blow was to fall 35 Sqn later that same year. On the night of 19th September 1942, the experienced Wing Commander J.H. 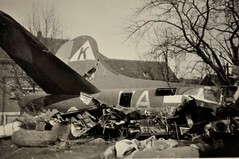 Marks was lost when his Halifax II (W7657) ‘TL-L’ crashed at Blesme near Saarbrucken with the loss of three crew members. 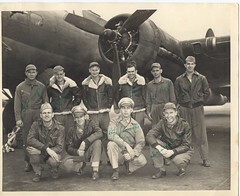 (This same identification was given to Halifax HR928 which also crashed with the loss of its crew see photo below). 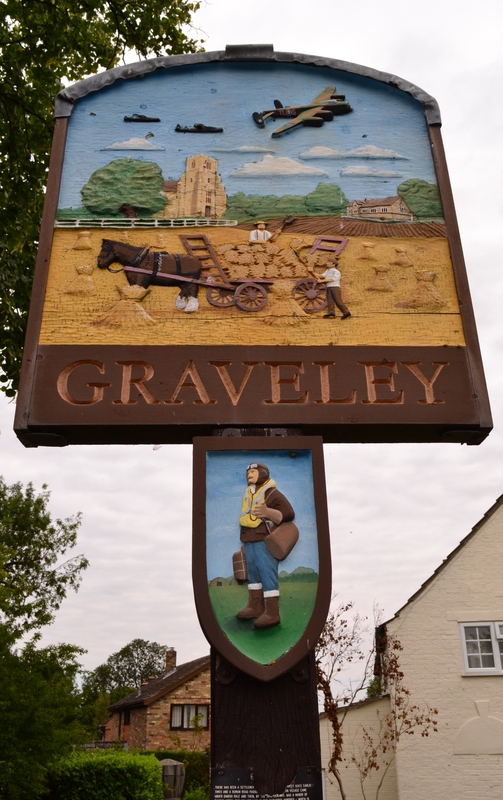 Graveley village sign depicts its aviation heritage. A number of other experienced crews were to be lost from Graveley over the next few months. But all news was not bad. The night of 18th/19th November saw a remarkable turn of fortune. Halifax DT488 (TL-S) piloted by Wing Commander B.V. Robinson, caught fire when flares in the bomb bay ignited. He ordered the crew to bail out, but as the last man left the fire extinguished itself. Robinson decided to try to nurse the bomber home. Flying single-handed, he reached the safety of RAF Colerne, Wiltshire, where he survived a crash landing. The six crew members who had bailed out also survived but were captured and taken prisoner by the Germans. As a result of his actions, Robinson was awarded a Bar to add to his DSO. Robinson would have a second lucky escape later on, after which, in May 1943, he would become the Station Commander of his home base at Graveley. 35 Sqn would carry out a number of missions marking and attacking strategic targets deep in the heart of Germany. By the end of 1942 the new H2S system was being introduced and a small number of 35 Sqn aircraft were fitted with the units. Missions were on the whole successful even after the Germans developed a device able to track aircraft using it; eventually the whole of the PFF were fitted with HS2. In early 1943, Graveley was to become the first base to use ‘FIDO’ the Fog Dispersion system, which led to a number of successful, poor weather landings. This in turn led to 15 other operational airfields being fitted with the facility, a major step forward in allowing Bomber Command to fly in poor weather. A number of major operations were undertaken by 35 Sqn over the coming months, and the loss of Group Captain Robinson on the night of 23rd/24th August 1943 in a Halifax II (HR928) ‘TL-R’, brought a further blow to the base. Following this, Air Chief Marshal Sir Arthur Harris restricted flying operations by base Commanders as the number being lost was becoming unsustainable. The new year brought new changes to Graveley. Mosquito B.IVs arrived with a newly formed 692 squadron (RAF). Their first mission would be on the night of February 1st/2nd 1944 in which a single aircraft would attack Berlin. Some of these 692 Sqn Mosquitos were later modified to carry the enormous 4,000 lb ‘Cookie’ bomb, This was first used by S/Ldr. Watts in Mosquito DZ647 who took off at 20.45 hours to attack Düsseldorf. The attack took place on the night of 23rd/24th February 1944 from a height of 25,000 feet. The initial bomb was followed by two further bombs from Mosquitos of the same squadron, DZ534 and DZ637. 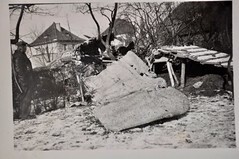 The first casualties for 692 Sqn were reported only three days earlier, on the night of 19th/20th February, which also proved to be the worst night of Bomber Command casualties in the war so far. Mosquito DZ612 ‘P3-N’ flown by F/L W Thomas (DFC) and F/L J Munby (DFC) took off at 01:05 to attack Berlin. 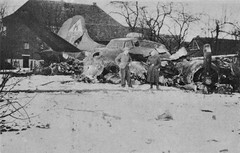 The aircraft was shot down and both crew members killed. In early April 1944, a small detachment of 571 Sqn Mosquitos (RAF Downham Market – Trail 7) joined 692 passing through on their way to RAF Oakington and then Warboys where they were eventually disbanded. An event not un-typical for Graveley. 692 would have another claim to fame a year later on January 1st 1945. In an attempt to assist in the Ardennes offensive they attacked supply lines through a tunnel, requiring the bomb to be dropped into the mouth of the tunnel where it would explode. These attacks were carried out between 100 and 250 feet using the ‘Cookies’ and were so successful that smoke was seen bellowing from the other end of the tunnel. The final 692 Sqn mission would be on the night of May 2nd/3rd 1945, and consisted of 23 aircraft in 2 waves of 12 and 11 aircraft against Kiel; all crews would return safely. 692 Squadron RAF, would operate a variety of Mosquito types during its life the B.IV, XIV and XVI and would prove to be highly successful and instrumental in 8 Group’s ‘Light Night Striking Force’. 35 Sqn RAF would go on to have a long and established career, as late as 1982. 692 Sqn on the other hand would move to Gransden Lodge in June 1945 where they were finally disbanded; a sad end to a remarkable career. Many highly regarded crew members were lost in operations from Graveley. including Sqn. Ldr. R. Fitzgerald and Wing Commander A. Cranswick. Graveley would have a high record of prestige loses such was the nature of the PFF. The remaining buildings utilised by the farm, which no longer resembles the Control Tower it was. Other units to grace the skies over Graveley would include detachments of 97, 115 and 227 Sqns all with Lancaster I and IIIs, many prior to disbandment toward the war’s end. 692 Squadron carried out 310 operations from Graveley losing 17 Mosquitos in all. 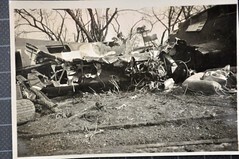 A total of 150 aircraft were registered either missing or crashed following operations from this station: 83 Halifaxes, 32 Lancasters and 35 Mosquitos. As one of the many pathfinder stations in this part of the country, Graveley is linked by the long ‘Pathfinder Walk’ that leads all the way to RAF Warboys in the north (Trail 17). Using this walk allows you to visit a number of pathfinder bases linking each one by open cross-country footpaths. Today, Graveley is all but gone. The control tower is now very well disguised as a farm-house, its shape considerably different to the original design, the concrete huts have been pulled down and the runways mainly dug-up. A couple of buildings do still remain next to the farm-house, storing a range of farm equipment. The perimeter track considerably smaller in width, remains used by the local farm for lorries to transport their goods to the main road. The perimeter track where bombers once lumbered. A small memorial has been erected and sad to say, is poorly maintained. It stands at the entrance to the former airfield on the northern side, now the entrance to the farm site. 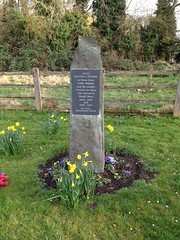 Graveley is typical of the sad end to many of Britain’s lost airfields. The wide open expanses that once resounded with the roar of piston engines taking brave young men to war, are now quiet and the sounds mere whispers in the wind. Lorries gently roll where the wheels of laden bombers once lumbered. The brave acts of those young men now laid to rest in a small stone overlooking where they once walked. As a pivotal station in 8 Group, Graveley and its crews deserve a much greater recognition for their dedication, bravery and sacrifice. A beautiful stained glass window can be found in Graveley church and is worthy a visit if time allows. After the quiet of Graveley we head south-east, toward our next planned destination, RAF Bourn. On the way, we make a brief stop at the now extinct RAF Caxton Gibbet, a little airfield with a colourful history. Having a history worthy of reading in itself, Caxton Gibbet has links to not only the Doomsday book, but also the Romans and the Bronze Age with traces of early settlements being unearthed only recently. Its folklore talks of brutal and violent executions and for a small village, it has a remarkable amount to shout about. Its history therefore includes a lot of death and this wouldn’t change during the Second World War. The small field that was Caxton Gibbet airfield was partly used as a relief landing ground. 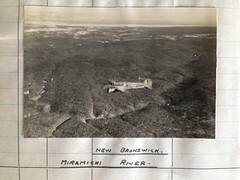 It was centred between the numerous airfields around here but it was never designed to be a major player nor hold more than about 80 personnel. It only had grass runways, temporary accommodation and a few small brick structures, including airfield defence positions, to signify its existence . It was used primarily by nearby 22 Elementary Flying Training School ‘F’ Flight, based at Cambridge flying a variety of biplane trainers. It was also used as an emergency landing ground and it was not surprising to see a wounded bomber attempting landing here. Surprisingly though, despite its lack of ‘operational’ importance, Caxton Gibbet suffered a rather large number of attacks from Luftwaffe aircraft. 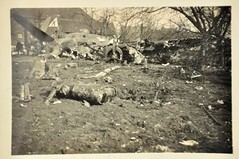 A number of bombs were dropped on it, several personnel were killed and damage was inflicted to a number of aircraft. However, despite all this unwarranted attention, little impact was made on this small and rather ‘insignificant’ airfield during its long history. A number of training accidents did occur, practising stalls and other dangerous manoeuvres did claim several lives from the young would-be pilots. Locals tell of aircraft falling from the sky and aircrews plummeting to their deaths. Opened in 1934 it would remain in use until the end of the war in 1945. A small gliding club utilised the site post-war but eventually it was closed and returned to agriculture. 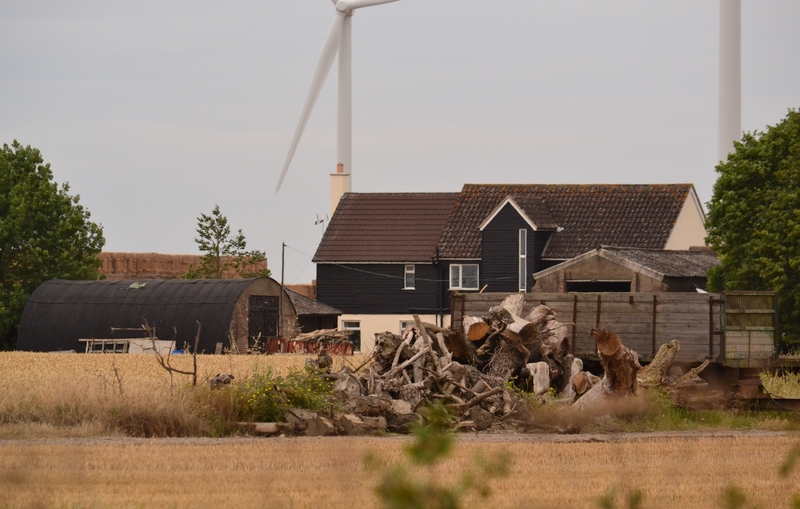 A small village that is battling for its own existence against the spreading conurbations that now surround it, Caxton Gibbet is slowly being absorbed into much larger developments. As for the airfield, it would seem it has now disappeared but its stories, like Caxton’s gruesome history, live on in the history books. From here we continue on our journey toward the currently active civil airfield and former RAF Bourn.